Winter is quickly approaching…at times it feels as if you’re looking at the world through the shroud of dingy grey gauze. The real beauty of winter can also be seen in the grey twilight when the pines have been darkened by an evening snowfall cutting you off from the worries of the outside world. This is what I look forward to in the coming months. I tried to capture that feeling in this Christmas card I’ve made for you today. Pounce Grey Flannel and London Fog Memento Ink onto the craft mat. Pounce a bit of Niagara Mist VersaMagic ink as well. Spritz a bit of Ink Potion No.9 over the inks. Tap the mixture a bit to mix it up and eliminate some of the harsh lines. Press a white cardstock panel into the ink mixture several times until you are satisfied with the results. 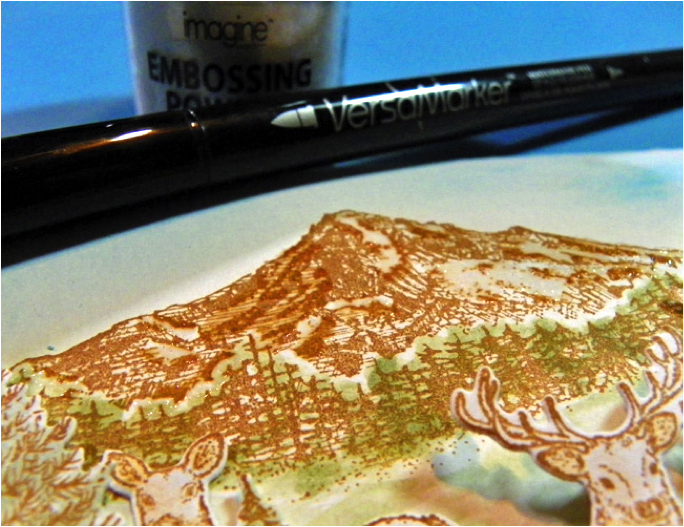 Stamp pine trees onto the inked panel using VersaFine Clair Morning Mist ink. Randomly dot Radiant Neon Amplify in White over the panel. Heat the Amplify medium to activate and puff it up. Trim and mat on black cardstock then adhere the panel to a grey card base. Stamp off the excess ink on the pine tree stamp on the inside of the card to create a ghostly grey pine forest. Add a bit of line work around the edge of the card to finish it off. Stamp sentiment on a scrap of white cardstock. Trim and adhere to the card front. I wanted to try the Radiant Neon Amplify Texture to create fun shapes for kids and decided to use stamps as well as some free hand skills. I stamped an egg, a strawberry, the moon and others with a light colored ink and then covered the stamp with a layer of various Amplify colors. Always preheat the heat tool before applying heat to the Amplify. This puffs the pigments quickly. Always clean the nozzle and cap the bottle after use. I would love to show you a fun, new way to use Radiant Neon Amplify Texture to create an interesting Snakeskin texture on your next tag or cardmaking project. In this project, I used it with a background stencil and colored with Fireworks sprays to achieve a dynamic, textured pattern on my tag. I am always looking for new, innovative ways to create texture and add visual interest to my work and Amplify really took it up a notch! The light foam that pops as a result of heat-activation is unlike anything else. I also love that it can be sprayed or painted over to achieve your desired look. 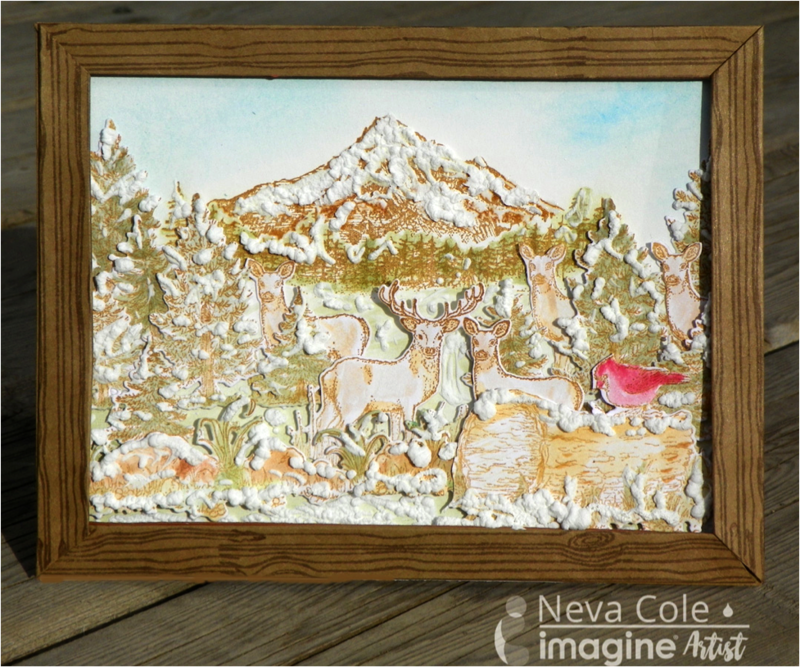 This is a scene I truly would enjoy gazing upon Mount Hood in the distance with a few deer peeking out through snow covered evergreens. I get to see deer in my yard on occasion hiding among the trees, and I can see mountains in my home town, just not out my front window! So, this is a fantasy scene created just for our Winter Window challenge. 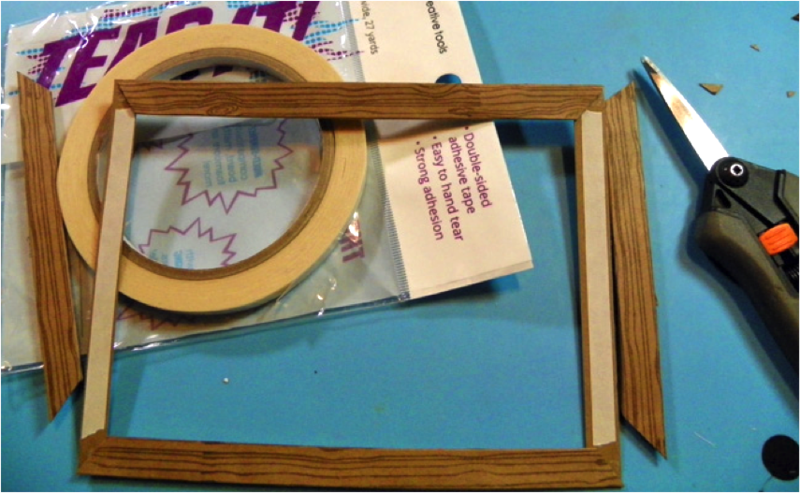 Learn how to make your own window frame using a wood grain stamp, Tear It! 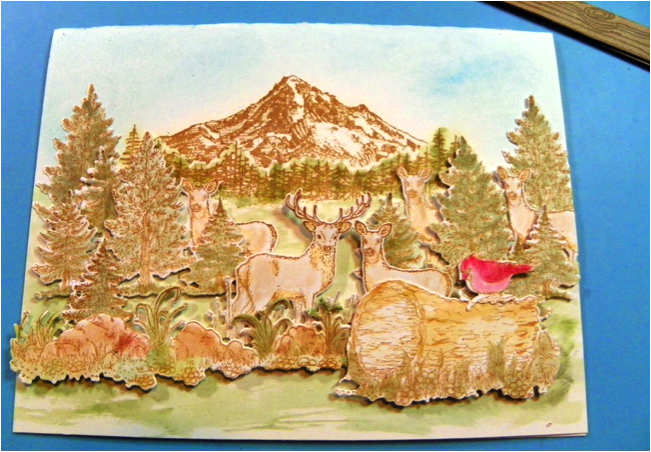 Tape and Kraft cardstock to surround a multilayered outdoor landscape. Stamp foreground images in StazOn Saddle Brown on white cardstock and die cut. Scribble Memento Markers on craft mat along with a spritz of Ink Potion No. 9 and watercolor images. 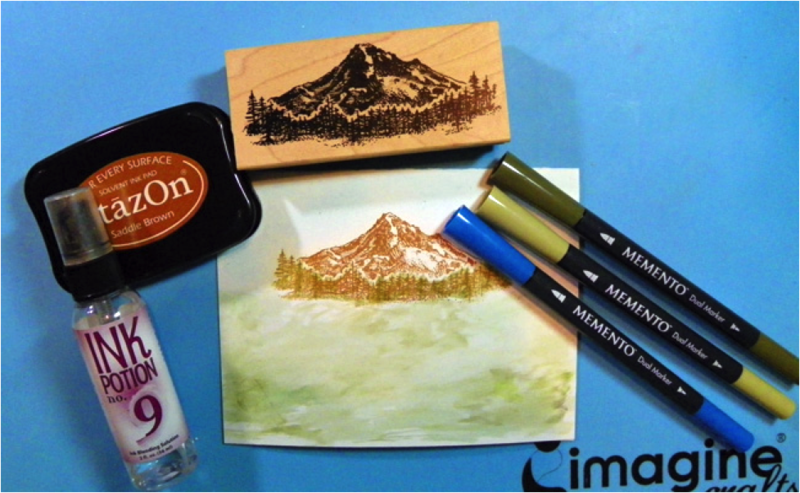 Stamp Mount Hood image in StazOn Saddle Brown on 5” x 6 ½” Bristol Board card base and watercolor. I choose to use Memento Markers in Pistachio and Olive Grove in the foreground and Danube Blue for the sky. Most of the foreground will be covered. 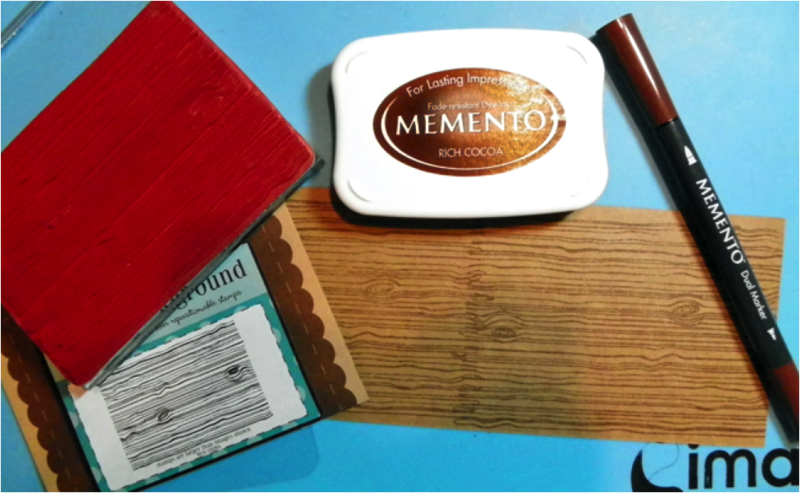 Stamp woodgrain image in Memento Rich Cocoa on a 3” x 11” section of Kraft cardstock. The image is not designed to line up, so I used a Memento Dual Tip Marker to draw in lines to finish the look. 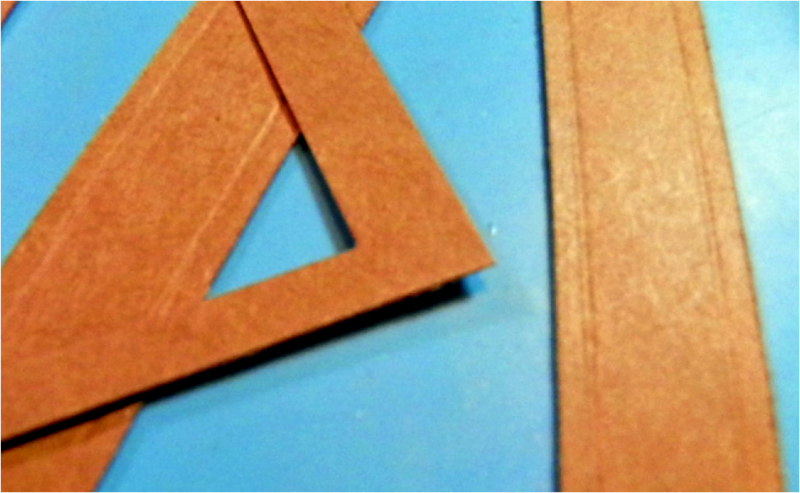 Trim Kraft cardstock into ¾” strips and score the back 1/8” from each edge. Die cut the center from Kraft cardstock trimmed to 5” x 6 ½” to make the supporting window frame. Apply Tear It! Tape to all four sides of the base frame. Fold edges of each section back on scored lines trim to fit the frame. Adhere each section to create window frame. 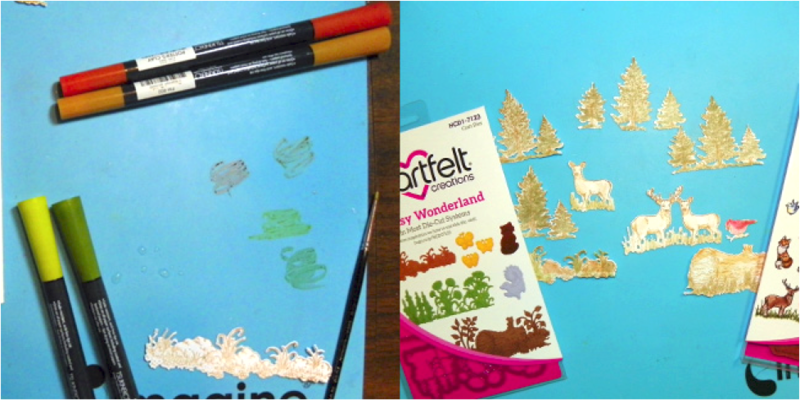 Arrange and adhere die cuts to create desired scene. The background images are adhered directly to the card base, the middle images have one layer of thin dimensional foam adhesive, and the foreground images have two layers of thin dimensional foam adhesive. Take care to avoid adhesive around the edges where the frame will be placed. Trim images that overhang the scene. 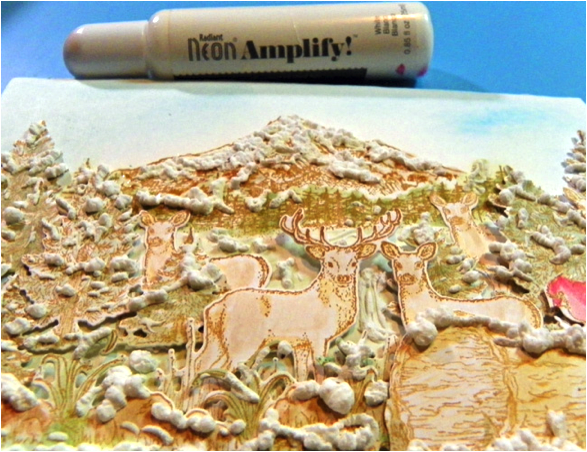 To add a bit of shimmer to the scene, color snow sections on mountain with Versa Marker and heat emboss with Iridescent embossing powder. When I view snow-covered mountains from a distance they seem to have a bit of a glimmer. Add bits of Radiant Neon Amplify! on the scene to mimic a light covering of snow in the foreground, and a snow topped mountain in the background. Heat to cure and puff up the Amplify! Adhere frame over the scene. Add any finishing details that inspire you!